This is a very exciting article on the how venous outflow could be implicated in MS. The diagram above shows the sites the researchers have identified as being restricted. There is a long tradition in cranial work of supporting drainage from the head by working at the thoracic outlet (or inlet, depending on what term you prefer, both are used for the same area). The first craniosacral therapist I ever saw would always start at the thoracic outlet, maybe he was on to something. In the thoracic outlet hold the hands are above and below the base of the neck – upper hand spread over the suprasternal notch, first rib and clavicles, the lower hand underneath the the cervical thoracic junction. I like to try and feel the shape of the hole made by the first rib and orient to the health of all the tubes moving through the region (dural tube, oesophagus, trachea, carotid sheaths). Pulsing arteries softening, spreading of the fascia sheets, easing of the movement of C7 and a shift in the first rib and clavicles all speak of change in this region. The image above includes drainage routes via ‘spinal column drainage route’, ‘pterygoid plexus’ and ‘vertebral vein’ that are fairly new to me – nice bits of anatomy to appreciate. 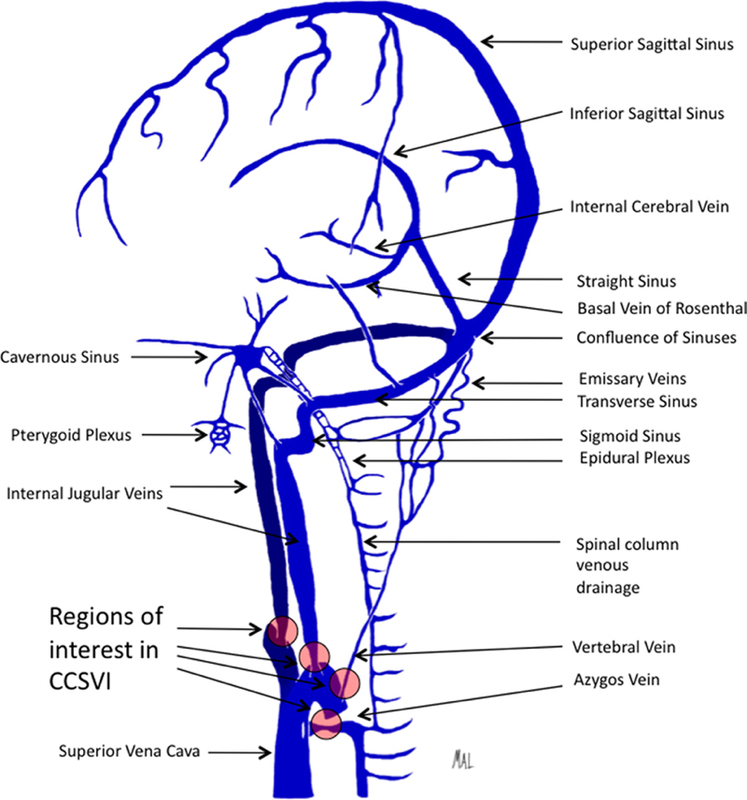 Another route for cerebrospinal fluid (CSF) to leave the skull you can consider is shown below. 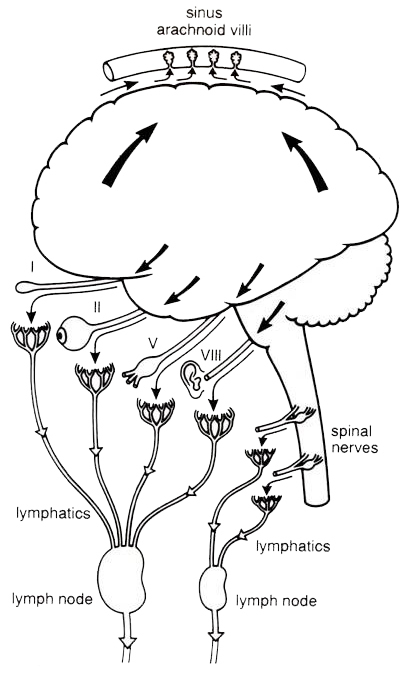 A significant amount of CSF drains as lymphatic outflow from the cranial cavity via the ethmoid (and to a lesser degree perineural spaces of cranial and spinal nerves) and is collected by the lymphatic vessels of the head and neck (Pollay 2010). This research helped me appreciate the dynamics of the ethmoid and cervical lymphatics as important in fluid draining from the skull. Pollay also indicates that poor outflow of CSF is not good for the health of the nervous system. I know that when I have an attack, my neck feels like someone has punched me on either side… then my memory starts to go, the bones in my hips feel like they are on fire or being soaked in acid – this runs up my spine and, this last attack, everything went black and I felt like I was going to die = this part went over 5 or so days. Then when I started coming out of this, the pain worsened throughout my body, my body weakened to the point I couldn’t walk or pick things up and I could barely remember my own name. I’m (with the help of my husband and sister) am going to save up to go for the therapy… It’s sad that a therapy that’s proven to help a lot of people isn’t even offered in Canada because we are a Prescription Nation.